The Undergraduate Research and Creativity Conference poster presentation will be in the Ferguson Ballroom March 27. The 12th annual conference is hosted by UA’s Office for Undergraduate Research and the Office for Research and Economic Development. Student poster presentations begin at 8:30 a.m. and last until 4:30 p.m. in the Ferguson Center Ballroom. Poster presentations are grouped by research areas, instead of by academic colleges or departments, to align with national trends of using interdisciplinary approaches to problem solving. The sessions, from earliest to latest in the day, are health sciences; life sciences and engineering; social sciences; and fine arts, humanities, business and education. 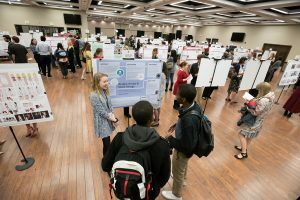 Students compete for cash prizes and gain experience in presenting and defending their research projects to judges during the poster presentations. In preparation for the event, students pair with faculty mentors who guide them through the development of their projects. Throughout the Ferguson Ballroom and in the halls leading inside, a creative showcase of artwork, sculpture, poetry and fashion design, as well as videos of fine arts performances, will be displayed for attendees. An awards luncheon will be held Monday, April 8, in the south end zone of Bryant-Denny Stadium.